Estate- and other pre-smoked pipes are a well known phenomenon in pipe smokers- and collectors circles around the world  but not very well known in Denmark. Below you will find a list of shops and on-line businesses that deal with pre-smoked pipes in a professional way. Several of them are specialized in the well known Danish brands, and you can be lucky to make a great deal here. If you have any questions or comments, or if you have had a good (or bad) experience with one of the shops found in our list, please let us know to share this with your fellow pipe smokers and collectors around the world. From time to time we will focus on one of the shops found in our shop list. The reviews of the shops will be saved along with any comments from the users for future reference. 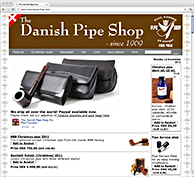 Please let us know, if we have overseen a on-line shop selling pre-smoked Danish handmade pipes. It is our goal to cover the marked the best way possible.